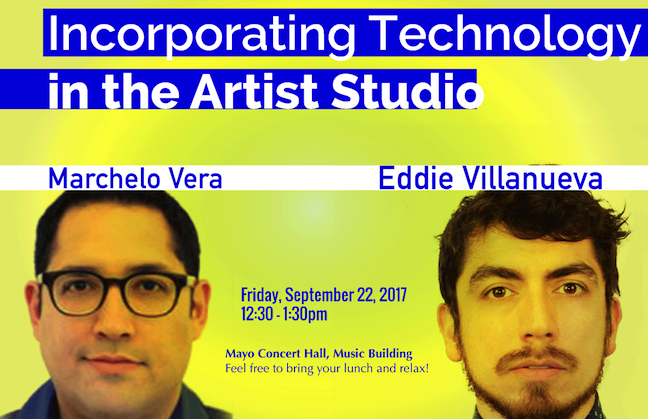 Department of Art and Art History Professors Marchelo Vera & Eddie Villanueva. Eddie Villanueva’s work operates within an expanded field of inquiry into socially and culturally sanctioned versions of a hetero-normative masculinity. He is interested in the ways by which male identity manifests itself both publically and privately. How gender is performed and how a chasm between the personal experience and the cultural creation and sanctioning of gender identity can lead to a sense of double consciousness or personal rift within one’s sense of self. Subjects addressed in his work include emotional vulnerability, violence, control, sexuality, legacy, social hierarchies, and childhood development. He explores the formation of his own gender identity by mining his personal history as a collection of events, experiences, thoughts, and lessons. Through self exploration, he presents points of reflection for the largely hidden phenomenological reality of the secret lives of men. Eddie Villanueva (b.1983, Milwaukee, WI) received his B.F.A. from the University of Wisconsin-Milwaukee and an M.F.A. from the University of Wisconsin-Madison. His work has been featured at the SCOPE Art Fair, Miami, and in Global Positioning System at the School of Visual Arts, New York, the North American Graduate Art Survey at the Katherine E. Nash Gallery, Minneapolis, and the Wisconsin Triennial at the Madison Museum of Contemporary Art. He received a Joan Mitchell Foundation MFA Grant in 2012, and a Mary L. Nohl Emerging Artist Fellowship in 2013. He has taught at UW-Madison, UW-Milwaukee, UW-Richland, and Brown University. Note: This event is free and open to the public. Feel free to bring your lunch and relax!